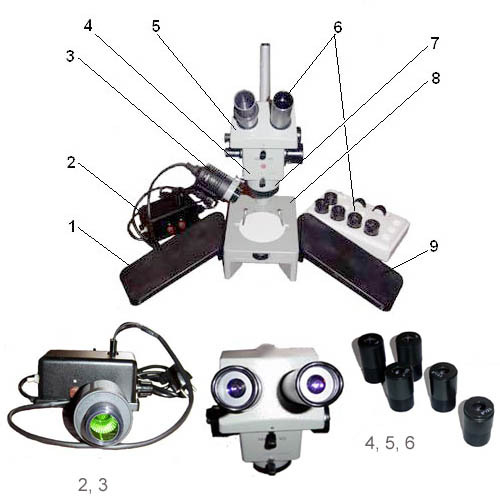 Provides true stereo image of the objects with top illumination on white and black background. Also allows to work with transparent objects on the glass stage with bottom illumination arrangement. 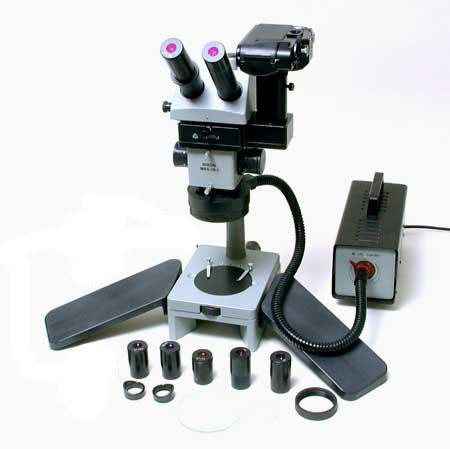 High clearance and built-in two-dimensional measurement reticules make this microscope an excellent tool for numerous applications in different areas of science and technology. Features modular design, professional quality performance, heavy duty construction. 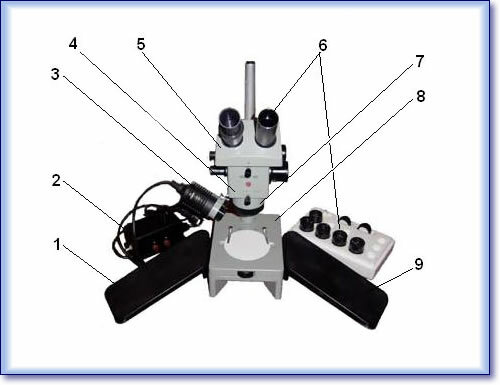 Consists of Main Unit, Binocular Head, Objective Lens, Base Unit, Illuminator with Power Unit. Hooked-up to the base post and includes 5 position switchable optical drum with magnifications .6x, 1x, 2x, 4x, 7x, and bayonet joints for the binocular head on the top, and for the objective lens from the bottom. Comes with 2 knobs on the side. One for switching the drum to change magnification. Another one with lock for smooth focusing. Fully adjustable optical binocular head with 45 deg. inclined binocular tubes 1.25" in dia. Comes with 2 sets of 1.25" eyepieces: 8x and 14x, and one extra 8x measurement eyepiece with exchangeable reticules - rule and grid. Allows interpupilary distance adjustments within 52-72 mm. range and left eye dioptric compensation. 6 optical elements assembly with 90 mm. focusing distance. Allows working space between the bottom of the lens and the specimen about 85 mm. 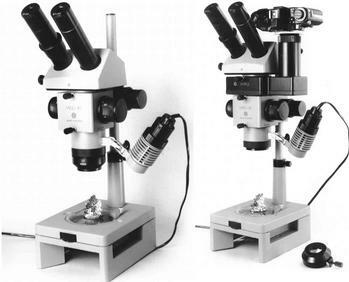 Depending on the combination of drum position in Main Unit and eyepieces installed in the Head provides system magnification within the range 4.5x - 100x, and linear field of vision within 2.5 - 40 mm. limits. Objective lens body supports illuminator bracket. 2x optional auxiliary objective available to double the power up to 200x. Consists of the lighted table and 20 mm. dia. post with stop bracket to secure the Main Unit. Lighted table has round cut on the top to accommodate 100 mm. in dia. 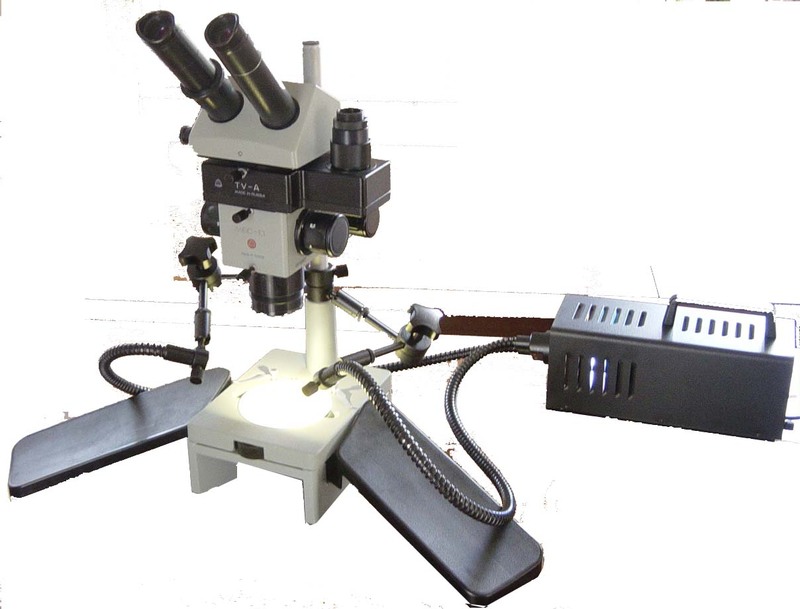 white, black, or transparent glass stages supplied with the microscope, specimen clamps, adjustable reflective white/mirror plates inside, plate adjustment handle, rear access hole for illuminator with light reflector, side arm rests. Illuminator comes with 8 v 20 wt lamp, condenser, and green filter. Installed on the adjustable bracket on the objective lens for top illumination and may be instantly replaced to the rear hole in Base Unit for bottom illumination. Lamp holder connected to the Power Unit which allows illuminating power adjustment in vide range. Power Unit cable plug directly fits to Euro style 220 v. wall circuit. For 120 v. USA wall circuit Power Unit should be used through the 110/220 v. wall plug transformer supplied with the microscope. Body with drum Б─⌠ 1 pc. Binocular attachment Б─⌠ 1 pc. Table for operating in reflected light Б─⌠ 1 pc. Table for operating in direct light Б─⌠ 1 pc. Power supply unit Б─⌠ 1 pc. Objective F=90mm Б─⌠ 1 pc. Illuminator with condenser Б─⌠ 1 pc. Lamp holder Б─⌠ 1 pc. Eyepiece 8x Б─⌠ 2 pcs. Eyepiece 14x Б─⌠ 2 pcs. Eyepiece 8x with scale Б─⌠ 1 pc. Eye shield Б─⌠ 2 pcs. Lamp MR-16 (12V, 20W) Б─⌠ 2 pcs. Light filter Б─⌠ 1 pc. Probe glass Б─⌠ 1 pc. Rubber strap Б─⌠ 1 pc. Flannel cloth Б─⌠ 1 pc. Maintenance instruction and certificate Б─⌠ 1 pc. case for spare parts Б─⌠ 1 pc. packing carton - 1 pc. Fused plug VP-1V 1.0 A/250 V - 2 pcs. Fused plug VP-1V 3.15 A/250 V - 2 pcs.